Congratulations Graduating Class on 2018! May You Always In Strength and Beauty Grow…. 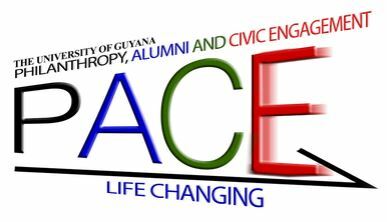 PACE and The University of Guyana (UG) on October 1 this year shared an anniversary of sorts. UG was entering its 55th year and PACE was entering its third. This year, you our cherished graduates and soon to be alumina share a wonderful historical marker also. You are the 52nd batch of graduates in the University’s 55 year history. Congratulations! You made it! As you stride across the stage on graduation day 2018, you will join about 25000 other men and women just like you – the bright and the brave whose pride of purpose, amazing tenacity and perspicacity distinguish them in the world. As you move on, you will look back with very strong memories of all kinds. This is what life is about: good times, hard times and in-between times. All of these are mixed into the sum total of your experiences. This produces that strong script of confidence that lets you know that whatever life throws at you – you can handle it. You have seen it before so bring it on! Many of your colleague alums are right here in Guyana or in far flung parts of the world doing amazing things. They often credit UG’s foundation as the catalyst of their many successes. Many are now eagerly re-connecting with their classmates, old Lecturers, and friends through the UG Alumni Associations which were created and launched this year in Georgetown, in Berbice, in London, in Toronto and in Washington Dc. We invite you to become part of this global movement today. Check www.ugalumnipride.com. Being a part of UG’s Alumni Association connects you with mentors, educational, training and employment opportunities . Being part of a UG Alumni Chapter also gives you a direct voice in the development of the University through your elected Alumi Association representative on The University’s Council and other statutory bodies. We urge you to stay connected to your University and to your cherished UG family and friends; for the strengths of connection are greater than the doldrums of isolation. God bless you as your continue your life’s journey. May you always “in strength and beauty grow”. Class of 2018! Go forth and energize the world! We are so very proud of you!